You Detective by the comedic team Fratwurst is a hilarious show playing at this year’s Toronto Fringe Festival. 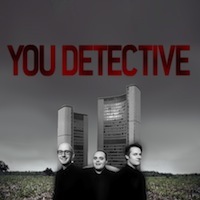 Evan Arppe, Eric Miinch and Josh Murray combine their creative efforts to bring you on a Toronto-based detective story. The show is an adult version of a choose-your-own-adventure story. The audience is given two options to explore and whatever answer gets the most applause, is the scenario Fratwurst will play out. The set-up was perfect as a throwback to cheesy 1980s buddy cop films. The three major characters of buddy cop films were taken on by the performers: the old cop who plays by the book, the younger wildcard with nothing to lose, and the chief who gruffly yells orders while sipping coffee. The major twist is that the two detectives are not buddies. In fact, since the audience is the new group of junior detectives, we have to pick our mentor. The show was fantastically funny. All the scenarios are ridiculous, and some are oddly impressive. Fratwurst deserves kudos for the clever idea to let the audience decide the show they want to see. Unfortunately, this makes the show difficult to review, since my show could be incredibly different from all the other shows. But isn’t that exciting? The audience roared with laughter during the entire performance. I found myself smiling the whole time. The show is an unbelievably fun time. I would highly recommend it for anyone who is looking for a laugh and a little bit of adventure.